View of Guisborough, Cleveland, from "Britannia Illustrata". 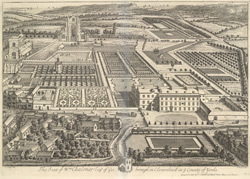 This monumental work illustrating country houses and their gardens was published in two volumes in 1720 and 1740. The original drawings were made by Leonard Knyff, a Dutch artist who came to England during the 1670s. Knyff's drawings were engraved by his fellow ex-patriot Johannes Kip. Kip had worked for William of Orange in Holland, producing portraits of his wife, Mary, and their courtiers. When William and Mary came to the British throne, Kip followed his patrons to England. Since many of the houses and gardens have been changed dramatically, or destroyed completely, Kip and Knyff's detailed engravings provide a valuable record of the development of garden design.